I heard rumors of this rough-housing but I honestly had never really experienced it myself before now. I don't know if I have just had my head in the sand for decades or what. The other night I came home from a brief respite away from my children (which landed me in the Washington Post) to my husband sitting on the couch, visibly exhausted. K: What happened? Are you okay? D: I'm fine. Your children are crazy. K: I know. What did they do now? D: They were jumping from the ottoman to the couch to my head back to the couch back to the ottoman. K: That sounds about right. D: Then we wrestled on the floor for another 15 minutes. D: Didn't you run them today? K: Like one would, say, run a dog? No. I did not. D: He so looked like he wanted to be in the middle of everything. D: I'm too old for this. Nate woke up the next day with scratches across his face and what appeared to be a bruised nose. Ethan had a scratch behind his ear and something going on with his forehead. When I asked them both if their injuries hurt, they looked at me like I was crazy. I promptly cut their nails. And this one? I think we may have more of the same. 10. Get your supplies. Do so without succumbing to the gimme monster or any other reportedly essential need for glitter glue or sparkle pencils. 9. Go to open house. This is the must-do activity of our back-to-school rituals. Kids get to connect with old friends and meet the new teacher before day one. 8. Clean out that pit of a bedroom. Everyone will understand something big is happening a lot quicker with an environment change. Nothing says school is coming like being able to see the floor for the first time all summer! 7. Line up the approved wardrobe for first day of school and beyond. For those of you with temperamental five year olds or fashion-challenged third graders, the sooner this happens the better. Fill the drawers with only pre-sanctioned color and design choices. Let the rest go to Goodwill! 6. Stock the frig with after school snacks. This will improve motivation to sit down at the table first thing in the door and cracking on that homework. Having something to look forward to on the snack platter is a lovely consolation prize for the agony of math or science. 5. Give that new bedtime a whirl. And while you're at it--how about that new wake up time as well? Better to know now what you are up against in making the switch to saner hours. Good advice on that front here. 4. 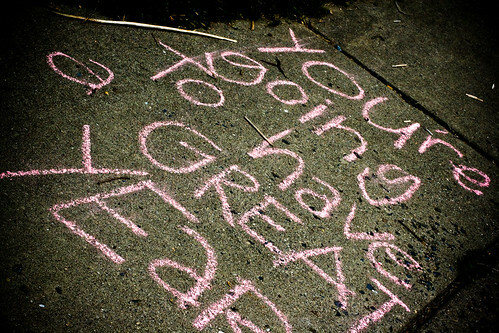 Get your sidewalk chalk ready and get those camera batteries charged while you're at it. Nothing soothes first day jitters like putting some good energy out there yourself. 3. Put your best intentions out there. Ask your kids what the best things are they could wish for in the new school year. Write them down, put them in a little wish jar and see what happens next. Good to know as soon as possible it's okay to dream big. 2. Get a great night sleep. Like the night before Christmas and the day of Halloween, I'm not sure how this can possibly happen, but give it the old college try. It's your motherly obligation. 1. Send them off with a big woohoo! We have an old friend who used to yell out the car window or the front door "Woohoo, world!" anytime her kids did anything exciting, noteworthy or just plain fun. Letting your kids know you're excited for them helps them show their deep down excitement, too. What's left on your to do list before school starts? It was a rough day at the community pool. Community usually involves sharing of some sort. A big round blue tube was the object of affection for all in the baby pool. Lucy was struggling to take turns and we had reached our limit of times we could navigate sucessfully. It was late anyway and time to go home. I gave the general five minute warning but one last conflict cut us short around 1 minute 32 seconds in. She was running from me, the exit was not going to be pretty. So I held her hand, she went limp which meant I ended up dragging her across the pool while I held a baby on my hip. "You're hurting me!" she screamed. I stayed calm and eventually made it to the chair where I could sit her down, put her shoes on and get the heck out of dodge. No such luck, she tried to run away again. Lucy requires me to keep my cool as I know if I lose it, all bets are off. After more crying and wrangling, she finally got her shoes on, we gathered our things and walked to the car. It is the walk where you can feel the eyes on you, some sympathetic, some judgmental. Either way, your most complicated parenting moment is on display. I tell myself this is part of parenting and most people have had experienced some form of public horror in their parenting life. Some of us have had more than others, apparently. Have you had these moments? Feel free to give us your best tantrum stories in the comments. We'll all feel better, at least I will. You ever have one of those days when you can't get anything done even though you are trying to just get one thing done? Before you know it, your children have the Costco-sized tub of animal crackers under the dining room table and you don't even care. You relieve your guilt with the memory that they are ORGANIC animal crackers and they really don't have very much sugar in them. Of course a serving size is probably 6 or 7 cookies and your kids cruised through that number at 9:45 this morning. It's now 2:50. You remembered to offer them lunch but you didn't crack the whip when they turned a lunch option down. I too would like grilled cheese sandwiches but somehow we ran out of bread. It seems slightly INSANE to wake the baby up just to go to the store to get some bread. Corn tortillas with peanut butter and jelly for anyone that can stomach them!! At 3:30!! Of course there is nothing for dinner either but that is hours away. You really have to get these documents proofed before sending them to the printer. Four business days for proofing, seven business days for printing and you are right on the edge of the $100 rush charge. Suddenly it's dinner time and Dad is home and I did clean the kitchen but the house looks like it was the victim of a classroom full of rookie cops on their first search warrant. I sat down beside Nate at the counter and offered him a lovely bowl of pork, rice and beans. He ate the first ten bites before he went all crazy demanding his milk. Then he refused to eat anymore. This picture? His passive resistance. It was awesome. I wish I could fit my entire body on the top of a stool. As a parent, do you ever to that calculation of how many bites equals enough nutrition to get your child through another day? If you are like me, you're looking at the calendar and thinking Oh dear Lord, how will I ever get these children back to a normal bedtime before they start school on Monday? The answer is: You won't. But. You can get headed in the right direction which is what we're doing right now. Wake everyone up bright and early. It doesn't matter if they get dressed, speak to you or are coherent in anyway. The point is that they wake up and get moving. By the time bedtime rolls around, they'll at least be a little bit more tired (and ready to sleep) then usual. Cut way back on screen time, especially in the evening. No more watching a movie together before you go to bed. The part of the brain that needs to wind down, winds up in the presence of visual media, so cutting that out of your child's evening diet will definitely help move things along in the nighttime hours. Do some family research online about how much sleep is required. If you have a blossoming logician at your house (like we do) this kind of fact checking makes a strong argument for a reasonable bedtime. This also cuts down on sibling issues because the research shows which ages need the most sleep--ironically, that number goes up and down depending on where your child is in development. Get those rooms in order. Now is the time to break out the comfy sheets, buy a new pillow and make that room a crib any child TV star would be proud of. In the same way your kids needed convincing sleep space when they were babies, they need a good place to snooze now. Reinforce as many positive associations with their sleep space as possible. Nudge bedtime a little earlier each night. Ideally, you would have started this two weeks ago (where did the time go?) but it's never too late to start. By gently moving your kids to an earlier sleep time, you'll be giving them the support they need to wake up naturally on their own come a school day morning. I know I've succeeded when no one needs a morning call to wake up and everyone comes down on their own accord--yes, it can happen! What's your best tip for getting kids back on schedule? 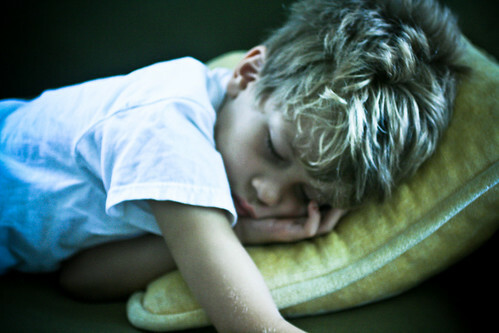 Do you ease them in gradually or go cold turkey on a school schedule bedtime? Or (perish the thought) do you actually put them to bed on time all summer long?? Tell the truth in the comments below. Jen posted about this amazing family who took a trip around the world. It made me think of my on-line friend Chris and her family who are just beginning their own adventure across North America. I am in total awe of these folks. I think they are giving their kids a tremendous gift. I had a hard time just coming up with a picture to represent adventure for this post. While we are definitely having our own adventures, they aren't exactly requiring passports, yet. I don't know if we will ever quit our jobs, save and travel with 4 kids around the world exactly but I would like to do something adventurous together. Can you imagine your family doing these kinds of things? Do you have a longing to see a particular beautiful place together? Where would you go? What holds you back from leading a life like this? Lately I have been worrying a little about Nate's walking situation. He has a fairly pronounced toeing-in and the poor child trips at least 10 times a day. The doctor says it's no big deal and we have to wait and see if it gets better when he gets a little older. He doesn't seem to mind that he trips all the time but I feel really horrible for him. Even though the doctor says that shoes will not fix his problem, I wanted to find some lightweight sneakers that would give his feet some support. Trouble is, those really nice sneakers cost $60. You read that right. I have the mother's guilt, so I almost did it. The only problem? My children's feet tend to grow in the fall. So do I really want to buy $60 shoes that might only fit for two months? I did what any mother of our generation does. I just bought Nate two pairs of shoes on Ebay. I know, I know. The people propagating that whole "kids shouldn't wear used shoes" are more than welcome to send me new shoes. There were two pairs and they looked barely worn (see above regarding fast growing feet). They fit and they are awesome. All except the part where Ethan spends at least 20 minutes every day trying to pry his feet into one of the pairs of "new, really fast shoes." K: They don't fit you. Ethan: Momomomomomom. I want new shoes. These shoes fit me. K: Ethan, they don't fit you. You wore that size two years ago. I looked down to see his feet practically folded in half to fit in the sneakers. And now I can't seem to find any "new, really fast shoes" on Ebay in his size. Just my luck, right? I have no idea why the shoes are such a hot item. They have laces. Who makes shoes with laces for 2-year-olds? Clearly someone who has never had children or someone with too much time on their hands. Gotta run. Gotta go find a pair of used/new sneakers for Ethan. I hope this isn't how they will be about girlfriends in 15 years. Thinking this summer got away from you before anything exciting happened. Let this video from a round-the-world traveling family inspire you to dream big for next summer. You have a whole year to plan! Miss the assignment of writing about what you learned on your summer vacation? Read this lovely essay from Supersisters favorite Meg Casey. There's no one mama more soulful than Meg who knows how to be playful, too. Are you gearing up for the first day of school? We want to remind you to get your sidewalk chalk and get ready to spread some good cheer to chase away the back-to-school jitters. It must be easy to try something new when you have so many to cheer you on and catch you if you fall. Lyra made her walking debut last weekend among lots of cousins and many adoring fans at the aquarium we were visiting. She was in complete joy of herself and her new skill. It's all she knows really. She smiles, everyone cheers. She laughs, everyone cheers. She claps, everyone cheers. She stands, everyone cheers. She takes a step, the crowd goes wild. She is the delight of our family in a way I can't quite explain, just by breathing. I think this should be the life of all babies, all people really. In two more seconds, she will decide it is time to get into everything and cause new havoc but today she is walking on top of the world. Ethan has decided he wants a cat. I have absolutely no idea where this brilliant idea originated but I began to push back as soon as I first heard it. It is complicated enough to find someone to watch your hundred pound dog when you go away for the night without having to ask someone to clean out a litter box too. Okay, I'm not a cat person. I'll admit it. I'm not a pet person in general. This is a great disappointment to my in-laws and apparently a greater disappointment to my small children. My love affair with the dog ended the second time he ate the rib eyes off the counter. Grant it, if it happened twice then clearly it was my fault. It did not make the cereal dinner in lieu of steak for dinner go down any better on either of those nights. Add a cat to that? I am certain that if we got a cat, it would be feisty and wouldn't behave. I hardly think that I need another surly, misbehaving entity in my house. Ethan doesn't care about my position. I had to go the Mom-route. Ethan: Mom. Mom. Mom. Mom. I want to get a cat. K: Ethan, we can't get a cat. Ethan: But I WANNNNNT one. K: We aren't getting a cat. You barely take care of the dog. Ethan: Mom. I feed Zinni every day. It's true. He actually is very good about taking care of the dog. Perhaps even better than the rest of us. Derek: Ethan, you can get a cat when you get older and can be responsible for it. Ethan: When will I be old enough? Derek: When you are ten (clearly picking a random number out of his head). Ethan: TEN???? No. I can take care of a cat now. Derek: When do you think you should be allowed? Derek: We will discuss it when you are six. Ethan: Dad. Six is a long time away. How will I remember to ask when I am six? Derek: You are very smart. And you have a very good memory. Ethan: I know how I can remember, Dad. If we talk about it EVERY DAY, then I'll remember when I turn six. I'm thinking it might be less painful to get a cat now than to discuss it every day for the next year and a half. What do you think?